Welcome to the companion website for our walking in Slovenia guidebook which has detailed descriptions, maps and photos of walks in the Julian Alps and the Triglav National Park of Slovenia. We also describe walks in the Slovenian Karst region and the Kamniško – Savinjske Alps, as well as in some other less well known but still beautiful areas of this wonderful country. As authors of this guide to Slovenia, published by Sunflower Books, we wanted to share with you more walks and lots more information than we could possibly fit in the book. By browsing the articles on the right you can easily see what the site has to offer. On the website you will find lots of background information to help you plan your walking holiday in Slovenia. Slovenia-Walking also has information on how to get to Slovenia, travelling in Slovenia, accommodation, weather forecasts, Slovene language help, holiday ideas and more. You will also find many links to useful Slovenian websites, most of which have an English translation. We aim to keep this information up to date. For each walk (41 of them) in our book, we include updates and show more pictures. The walks on the website are grouped around various tourist destinations in Slovenia, including Bled, Bohinj, Kranjska Gora, plus Bovec and Kobarid in the Soča Valley, that have a good range of accommodation, including hotels, apartments, rooms and camping sites. (You can book your accommodation via the website by following the links to Hostelbooking.com and Booking.com). We have also written about some of the tourist attractions at or near each location and the available public transport. Additionally, you will find links to some of the attractions and the nearest Tourist Information Centres. Lots of our walks are accessible by bus but displaying accurate timetables is impossible in the book and, in any case, would probably be soon out of date. Therefore, where appropriate, we have provided links to the most recent timetable information available for each walk. Do you have a smartphone or iPhone? Mobile coverage/Internet access is good in Slovenia and Slovenia-Walking loads very quickly, so you can take this website with you on holiday! We hope that the bus timetable links will be particularly useful. (All walks and articles are linked from the ‘Sitemap’ found at the bottom of the home page on your mobile screen). 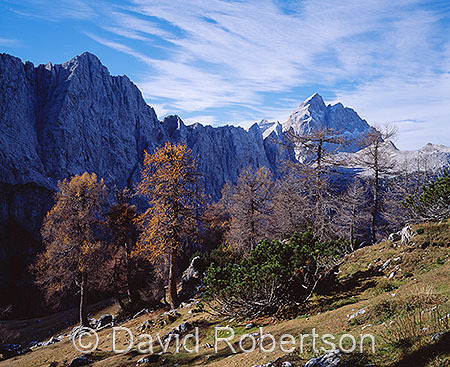 One aspect of walking in Slovenia that our book cannot cover is multi-day trips using the mountain huts. Staying in a mountain hut, high in the Julian Alps, is a wonderful experience and makes the ascent of Triglav, Slovenia’s highest summit, a tempting possibility. In September 2009 we undertook a two week backpack in the Julian Alps, climbed Triglav and stayed in the huts – our account includes some hints and tips on what you might need and how to save some money. We are adding articles all the time, so please check back later! Note and Disclosure: To fund the Slovenia-Walking website we use advertising. For full details of the advertising found on this site, please visit our advertising page.